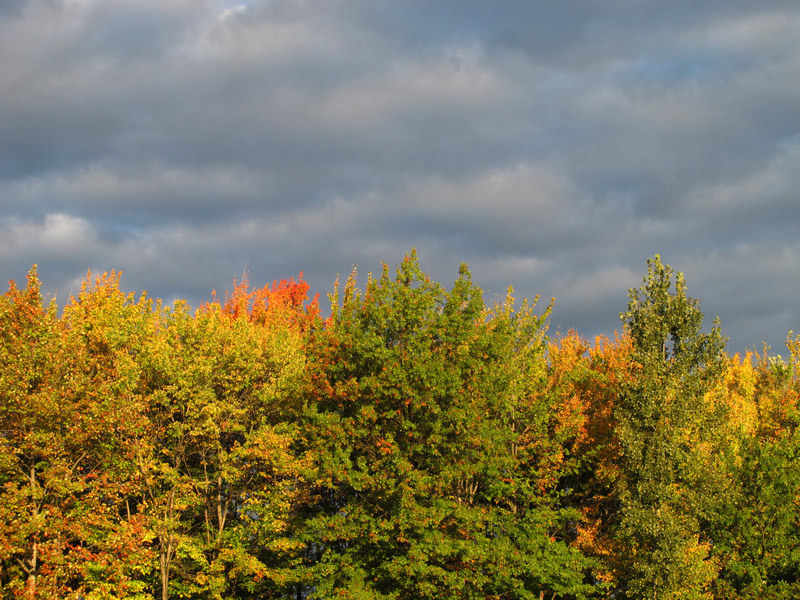 First color of autumn trees stands brilliantly illuminated against dark, clouded sky. I may not have the most beautiful or interesting commuter route to follow in my daily routine but it does have much to offer. This morning I was treated to trees, many of them with early fall color, brilliantly illuminated by morning sun against a dark, cloudy sky. I stopped in the outskirts of Stongsville to snap a few photos on my way to work. This evening, traveling home via the Cleveland Metropark’s Parkway, I caught a glimpse of a Great Egret I’ve been wanting to photograph. It seemed closer to the shore of Wallace Lake than normal. I swung into a parking space and hiked a short distance to the waters’ edge. My Canon PowerShot G11 is a terrific little camera but didn’t have enough telephoto power to capture the image I wanted but I got something. In fact, I noticed in the distance behind the big white bird, there was also a big gray bird… a Great Blue Heron. I moved closer but, each in its turn, the birds flew off before I could get in good range. Not bad: beautiful scenes at the start and finish! 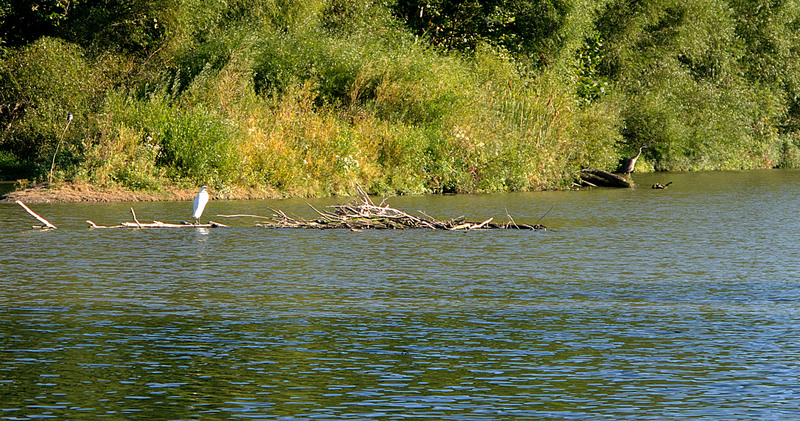 A Great Egret and a Great Blue Heron have neighboring fishing spots at waters' edge in Wallace Lake. Canadian people call it Indian Summer. Do american people say the same ?? Actually, Indian Summer comes later…. At the beginning of october, doesn’t it ? It’s called Indian Summer but apparently only if warm weather returns after the season’s first frost…. At least that’s the way I seem to recall it works! So European people use this expression ill-advisedly. We usually speak about Indian Summer when the beginning of the autumn is warm and dry, and when trees wear magnificent red and brown colors. In France, the period of nice, sunny and mild weather that might occur after the first frosts is sometimes called Summer of Saint Martin (L’été de la Saint Martin). (Saint Martin is celebrated on November 11th).